The snowfall that covered Greece two weeks ago left behind some scenes of exquisite beauty, protothema.gr reports. A small stone bridge which once linked Epirus and Thessaly Regions and the flora are covered in snow, while the rushing waterfalls complete the fantasy-like vista. 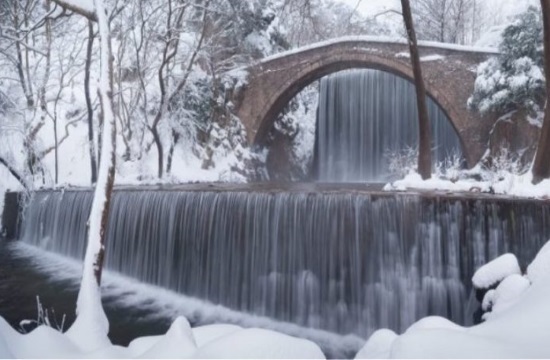 The spectacular images were captured at the waterfalls of Paleokarya, in the prefecture of Trikala. A white veil has settled over the historic stone bridge creating an awesome view, reminiscent of a scene straight out of Lothlorien in Lord of the Rings. This is one of the most enjoyable and scenic routes in the area.